A technology to ask yourself the right questions. To support each individual in a team. A reflective tool for individual and collective impact. Prompt team members to improve decisions, priorities, goals, creativity, confidence and communication. PocketConfidant AI joins The Refiners acceleration program in San Francisco. Do you ever get stuck? Would you like to make better decisions? Have you ever wished you had the right words to explain yourself? Our purpose is to help people live and work better together. We help managers support each team member to increase their personal capacity for self-reflection, decision-making, prioritization, goal-setting, communication and confidence through an automated self-coaching tool. We use technology to give each individual access to conversations where they can question themselves and develop the awareness they need to create options and make better decisions. Today’s workforce expects managers to be coaches too, but finding the time, training and budgets to succeed can be hard if not possible. Where humans, time and budgets aren't scalable, we provide technology to release the pain and create value for organizations and impact individuals' effectiveness. 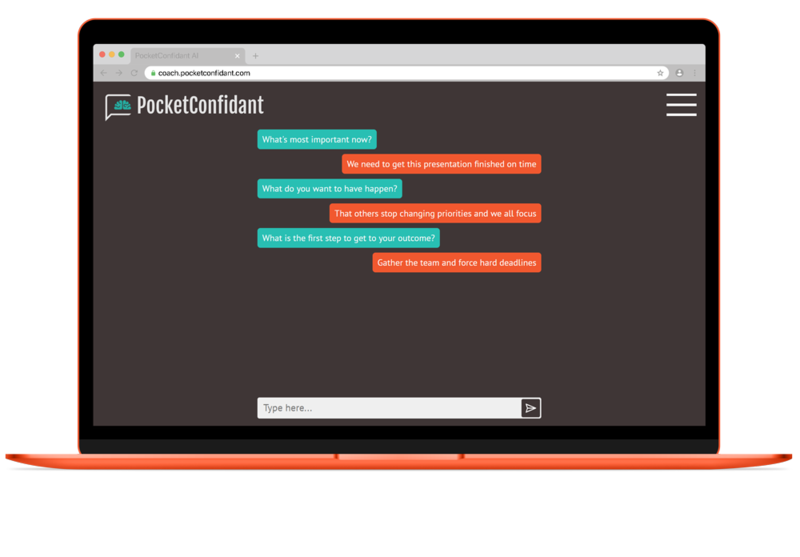 PocketConfidant is private and confidential. Conversations are depersonalized and encrypted so that individuals' privacy is protected at all times. No individual or group will ever see or know the contents of another’s conversation without their explicit consent. PocketConfidant is widely accepted by professionals, employees, managers and coaches because it doesn’t replace a human professional but provides the mechanisms that support each individual when they need it. 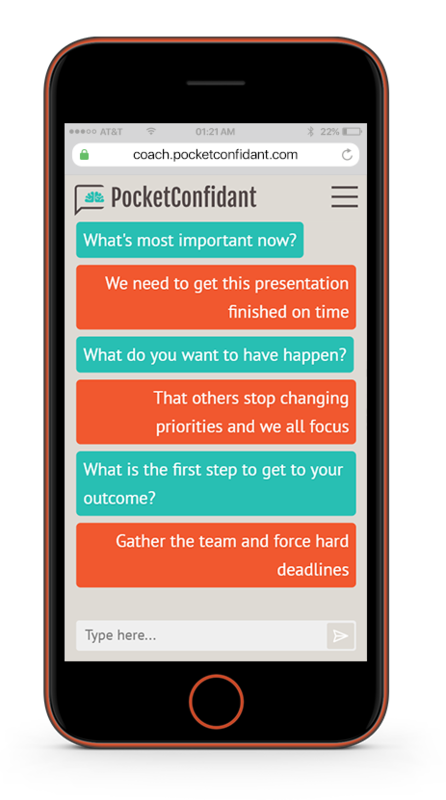 PocketConfidant is a coaching tool to help you formulate thoughts and challenges in real-time. Guiding you to clarify your own thinking, identify your precise needs, resources and goals, formulate your outcome or intention and envision what you want to do next. Unlike human coaches, mentors or advisors, PocketConfidant does not provide any advice or offer solutions or suggestions, it guides individuals to find solutions on their own from the untapped wealth of wisdom within. Stay in touch and get updates ! Anything shared with PocketConfidant stays private. You are in the driver’s seat, you only get questions, there is no risk. Our approach is: no influence, no advice, no diagnosis.